Barcel Takis Xplosion are mini corn tortilla chips that are rolled up like a small taco (similar to the deep fried taquitos). 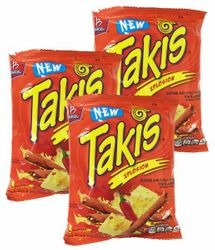 Takis eXplosion are made from corn masa flour, soybean and/or palm and/or canola oil, maltodextrin, sugar, iodized salt, potassium chloride, citric acid, natural and artificial flavor, whey (milk), monosodium glutamate, soy, artificial colors). 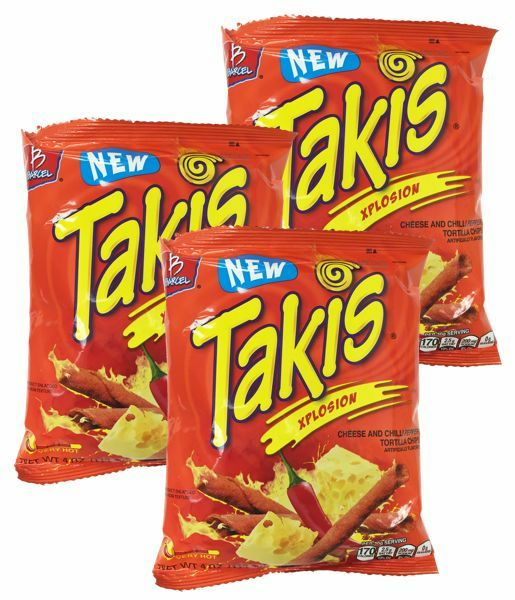 These Takis Xplosion are made in Mexico and imported/distribuited by Barcel USA LLC. Barcel was created by Grupo Bimbo. This is currently my favorite variety of Takis. They offer a strong cheesy flavor reminiscent of Doritos before giving you a perfect amount of heat to leave the tongue burning pleasantly. There are also notes of citrus to the nose and taste that are absent from other flavors, including those that are ostensibly lime-flavored. Highly recommended.